On Friday night, the Jonas Brothers took a little college trip to Penn State University where they surprised students with a performance. 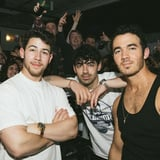 Joe, Nick, and Kevin casually showed up at one of the school's popular local bars Champs Downtown, and they even brought their partners - Sophie Turner, Priyanka Chopra, and Danielle Jonas - along for the fun. Prior to their appearance there were rumors that the recently reunited band would be performing at the venue. And those rumors turned out to be true, as Joe himself kindly confirmed. During their set, the Jo Bros performed a number of hits, including their newest singles "Cool" and "Sucker." But the fun didn't stop on stage, as they also got behind the bar and began serving drinks. Sophie even received a warm welcome from Game of Thrones fans who began chanting, "Lady Stark!" Attendees were understandably hyped out of their minds as the superstars partied it up in Pennsylvania. Ahead, view more photos and videos from their wild night!